Awareness of CRMO/nonbacterial osteomyelitis is paramount to establish an early diagnosis and provide an individualized treatment, avoiding unnecessary procedures. Department of Orthopaedics, Hospital Prof. Doutor Fernando Fonseca, Estrada IC19, 2720-276 Amadora, Portugal. R. Augusto Macedo, 12-3C, 1600-794, Lisboa, Portugal. Introduction: Chronic recurrent multifocal osteomyelitis (CRMO) is a rare autoinflammatory condition. The clinical picture consists of sterile osteomyelitis, typically with multiple-site lesions in the metaphysis of long bones and not uncommonly, symmetrical bone involvement. It is a poorly understood entity, whose prognosis, etiology and ideal treatment are still controversial. The authors report a case of unifocal presentation with an atypical location. Case Report: A previously healthy 12-year-old Caucasian girl came to our institution due to progressive pain on her left thigh for the previous 3 months. 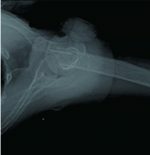 The initial X-ray showed a permeative, diaphyseal lesion of her left femur, with marked periosteal reaction. The differential initially included Ewing’s sarcoma, osteosarcoma, subacute osteomyelitis, and Langerhans cell histiocytosis. Needle and open biopsies demonstrated the presence of chronic inflammatory infiltrate, with fibrosis, but no signs of neoplastic disease. Serologic and microbiological studies failed to demonstrate an infectious etiology. 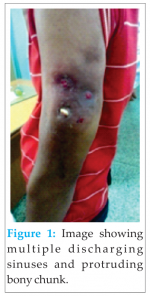 The patient was treated with nonsteroid anti-inflammatories, corticosteroids, and bisphosphonates for 6 months. Although no antibiotics were employed, the patient showed clinical and radiological improvement, at 18-month follow-up. Conclusions: CRMO is a rare condition, and the absence of specific features constitutes a diagnostic challenge. A high level of suspicion is paramount to avoid unnecessary biopsies and repeated antibiotic regimens. Unifocal presentation of this disease, atypical locations, and absence of recurrence have all been previously reported, with the evidence pointing to a shared etiological process with no distinction being made between these variants. For this reason, the authors believe that the term “nonbacterial osteomyelitis” might be a more all-embracing designation. Keywords: Nonbacterial, chronic recurrent, osteomyelitis. Chronic recurrent multifocal osteomyelitis (CRMO) is a non-infectious inflammatory condition of the bone of unknown etiology. Its reported incidence is 1/1.000.000 and affects more women, at a ratio of approximately 2:1-5:1 [1, 2]. The currently used term, CRMO, was proposed by Bjorksten, but references to chronic multifocal symmetric osteomyelitis and others are common . It is a pediatric condition sharing a few common features with the synovitis, acne, pustulosis, hyperostosis, and osteitis syndrome seen in adults; some investigators suggest that CRMO represents a subgroup of this entity . Patients are typically children or adolescents, presenting with bone pain, which may concur with tenderness, swelling, and other inflammatory signs. Symptoms are typically intermittent, lasting weeks to months, after which they subside and relapse. The mean duration of active disease is between 2 and 5 years but has been reported to be as high as 20 years . Factors identified as duration predictors are younger age, number of lesions at presentation, and total number of lesions . The involvement is more frequent at the metaphyses of the long bones and is often symmetrical, although other uncommon skeletal sites have also been described [5, 6]. Radiologically, there is an osteolytic lesion with early sclerosis and hyperostosis, though sclerosis and hyperostosis are suggested to be involved in the natural bone reparative reaction. With enough time, lamellated periosteal reaction occurs. Some lesions might be asymptomatic and are incidentally found on radiographs of other regions. Regional magnetic resonance imaging (MRI) typically shows marrow edema and whole body MRI or bone scintigraphy can help in detecting asymptomatic lesions and assess plurality, which helps in excluding other diseases. Histologically, there is nonspecific osteitis with an inflammatory infiltrate, consisting of polymorphonuclear and giant cells. Bone resorption and reactive bone formation typically follows, with sclerosis and lymphocytic infiltration. At even later stages, there may be complete resolution of this infiltrate, and only fibrosis with non-arranged, immature bone is to be found. It has been proven to be a non-benign disease in the long term, with persistent pain and bone deformity as the most common complaints. Premature epiphyseal fusion with short stature or limb length discrepancy and long bone deformity has been reported in patients with immature skeletons. Quality of life is affected, with withdrawal from sports, school interruption, and job impairment seen in a range of 7-75% of the patients [2, 7]. We present the case of a young patient with unifocal diaphyseal presentation of this disease. A 12-year-old Caucasian girl presented to our clinic with a history of worsening the left thigh pain for the last 3 months. She was previously healthy, with no history of trauma, and neither she nor her mother could recall any triggering factor for the onset of the pain. There was a decrease in the appetite but no weight loss or fever. At the time of initial evaluation, she was experiencing pain throughout the day and night. She quantified her pain as 8 out of 10 in the visual analog scale (VAS). She had stopped all physical activities completely and was walking with the aid of crutches. The thigh was slightly swollen and was very tender to light touch, with quadriceps atrophy, but no increase in local temperature. The active and passive ranges of motion of the hip and the knee were globally decreased, due to severe pain. The rest of the clinical examination was normal, in particular, no foci of infection were apparent elsewhere in the body, and no skin conditions were detected. She had no pets, no history of travel, and her familiar history was unremarkable. Her initial blood work revealed only a slight increase in the erythrocyte sedimentation rate (24 mm/h). The initial radiographs of the left thigh showed a proximal third diaphyseal lesion of the left femur with aggressive appearance (Fig. 1). It was a centro-medullary, permeative lesion with ill-defined margins and a wide zone of transition. There was cortical thickening with areas of scalloping and cortical erosion, and circumferential onion skin appearance denoting moderately aggressive periosteal reaction. No Codman’s triangle or sunburst appearance, indicating faster and more aggressive periostitis, were visible. MRI showed a 12-cm medullary lesion with hyposignal in T1-weighted and hypersignal in fat-suppressed T2-weighted images, with medullary enhancement after contrast injection. There were areas of cortical disruption, extensive periosteal reaction and perilesional soft tissue edema, but no soft tissue invasion (Fig. 2 and 3). Needle biopsy was performed 2 weeks after the initial presentation for microbiological and pathological evaluation, and no evidence was found for infection or tumor (Fig. 4). Serology for Bartonella, Brucella, Salmonella, Tularemia, Coxiella and Mycobacterium tuberculosis were negative. The patient was kept under observation by the tumor team. She was taking acetaminophen for pain relief and the clinical picture remained unaltered for the next month. A second biopsy was obtained through a mini-open approach again, showing no evidence of tumor or infection. At this point, the diagnosis of CRMO was considered, and a scintigram was obtained, which showed unifocal heterogeneous uptake at her left femoral diaphysis, with no other suspicious hot spots. She was then started on 250 mg naproxen t.i.d. with 20 mg omeprazole, 10 mg prednisone daily and a single dose of 30 mg pamidronate. Her VAS score showed initial improvement, from 8 to 3, with pain affecting her only on weight-bearing and no pain at night. She was maintained on this regimen for 6 months. During this period, she also experienced isolated episodes of pain on her right thigh and on her left ankle, with no abnormal findings on the radiographs. After an 18-month follow-up, she demonstrated progressive improvement of her left thigh pain that occasionally recurred with less and less frequency. Although she was walking without crutches, she was still restricted from physical activity. CRMO is a rare disease and its diagnosis is difficult due to the lack of specific features. Most recent evidence suggests an autoinflammatory origin, but the etiology is yet to be established conclusively . CRMO has been hypothesized to be the response to an undetected infection. Some authors reported cases of infectious multifocal osteomyelitis due to facultative bacteria, which could not be detected by the aerobic-seeking culture media used in regular laboratory analyses . Other authors reported cases whose biopsies were positive for commensal cutaneous bacteria such as Staphylococcus epidermidis and Propionibacterium acnes, but these are generally believed to be the result of culture contamination. In our case, there were no detectable risk factors, and microbiological or serological evidence indicating an infectious agent. Our patient did not have a history of autoimmune conditions, including peripheral arthritis, Crohn’s disease, psoriasis, or spondyloarthropathies . Being an exclusion diagnosis, the clinician has first to rule out malignancy (Ewing’s sarcoma, osteosarcoma, and lymphoma), Langerhans cell histiocytosis, osteoma osteoid, and subacute osteomyelitis. The finding of multiple-site involvement surely helps the clinician in establishing the diagnosis of CRMO. However, when the finding involves a single or atypical (e.g. diaphyseal) lesion, the clinician is confronted with a diagnostic challenge. Manson  proposed the diagnostic criteria that are shown in Table 1, where plurality of lesions is an important feature. However, as in our patient, other case series also have shown patients where a single lesion was detected. In Girschick’s series of 30 patients, for example, 10% had unifocal recurrent form of disease and 30% had a unifocal single time episode . For this reason, we agree with Cimolai et al. and Girschick et al. [3, 7] that the term CRMO might be too restrictive, assuming plurality/recurrence of lesions as sine qua non features. Other authors use the term nonbacterial osteomyelitis (NBO), which we believe might be a more all-encompassing term . Jansson et al. proposed different diagnostic criteria for NBO (Table 2) , which our patient met. The optimal treatment for this disease is still under debate. The first-line treatment for CRMO is nonsteroidal anti-inflammatory drugs, reported to be effective in 80% of patients for symptomatic relief . In non-responders, glucocorticoids have shown to be effective [7, 10, 11]. Anti-tumor necrosis factor α (TNFα) drugs have been used with good results . TNFα is a proinflammatory cytokine and was found to be elevated in CRMO patients [10, 14]. We decided to postpone the need for biological therapy unless the patient experienced no improvement with first-line drugs. Approximately 80% of patients, reviewed from the available case reports and series, showed improvement with bisphosphonates . The radiological decrease in size was also observed in some lesions. The action of these drugs is not fully understood, but it appears to be linked to a decrease in lesion expansion, a phenomenon that depends on osteoclastic activity at the edge of the lesion. However, the prompt symptomatic relief experienced by some patients also suggests a role for a non-anatomical action, probably linked to the anti-inflammatory properties of bisphosphonates. In our patient, significant pain relief was obtained after beginning bisphosphonate therapy. However, it is hard to establish causality, since other drugs were also started simultaneously. CRMO is a rare disease and much remains to be known about the ideal management of this condition. Diaphyseal and/or unifocal lesions might occur, and the use of more broad criteria has increased diagnosis sensitivity. Awareness about this disease and its variants is paramount to prevent unnecessary repeated biopsies and antibiotic regimens. Prospective studies with a control group would help in identifying the optimal treatment and the effects of the drug classes discussed in this text. Chronic recurrent multifocal osteomyelitis can present with unifocal lesions, atypical locations or absence of recurrence. A high level of suspicion is paramount to avoid unnecessary biopsies and repeated antibiotic regimens. The term “nonbacterial osteomyelitis” might be a more all-embracing designation. 1. Chun CS. Chronic recurrent multifocal osteomyelitis of the spine and mandible: case report and review of the literature. Pediatrics 2004;113(4):e380-e384. 2. Catalano-Pons C, Comte A, Wipff J, Quartier P, Faye A, Gendrel D, et al. Clinical outcome in children with chronic recurrent multifocal osteomyelitis. Rheumatology (Oxford) 2008;47(9):1397-1399. 3. Cimolai N. Chronic multifocal osteomyelitis: Is infectious causation a moot point? J Infect Public Health 2011;4(4):157-168. 4. Kahn MF. Psoriatic arthritis and synovitis, acne, pustulosis, hyperostosis, and osteitis syndrome. Curr Opin Rheumatol 1993;5(4):428-435. 5. Van Howe RS, Starshak RJ, Chusid MJ. Chronic, recurrent multifocal osteomyelitis. Case report and review of the literature. Clin Pediatr (Phila) 1989;28(2):54-59. 6. Meyer zu Reckendorf G, Milon E, Pous JG. 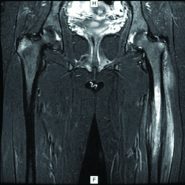 Chronic recurrent multifocal osteomyelitis (C.R.M.O.). A case report and review of literature. Eur J Pediatr Surg 1996;6(5):312-315. 7. Girschick HJ, Raab P, Surbaum S, Trusen A, Kirschner S, Schneider P, et al. Chronic non-bacterial osteomyelitis in children. Ann Rheum Dis 2005;64(2):279-285. 8. Galeazzi M, Gasbarrini G, Ghirardello A, Grandemange S, Hoffman HM, Manna R, et al. Autoinflammatory syndromes. Clin Exp Rheumatol 2006;24 1 Suppl 40:S79-S85. 9. Kourtis AP, Ibegbu CC, Snitzer JA, Nesheim SR. Recurrent multifocal osteomyelitis due to Mycobacterium avium complex. Clin Infect Dis 1996;23(5):1194-1195. 10. Jansson A, Renner ED, Ramser J, Mayer A, Haban M, Meindl A, et al. Classification of non-bacterial osteitis: retrospective study of clinical, immunological and genetic aspects in 89 patients. Rheumatology (Oxford) 2007;46(1):154-160. 11. Manson D, Wilmot DM, King S, Laxer RM. Physeal involvement in chronic recurrent multifocal osteomyelitis. Pediatr Radiol 1989;20(1-2):76-79. 12. Beck C, Morbach H, Beer M, Stenzel M, Tappe D, Gattenlöhner S, et al. Chronic nonbacterial osteomyelitis in childhood: Prospective follow-up during the first year of anti-inflammatory treatment. Arthritis Res Ther 2010;12(2):R74. 13. Ferguson PJ, Sandu M. Current understanding of the pathogenesis and management of chronic recurrent multifocal osteomyelitis. Curr Rheumatol Rep 2012;14(2):130-141. 14. Hofmann SR, Schwarz T, Möller JC, Morbach H, Schnabel A, Rösen-Wolff A, et al. Chronic non-bacterial osteomyelitis is associated with impaired Sp1 signaling, reduced IL10 promoter phosphorylation, and reduced myeloid IL-10 expression. Clin Immunol 2011;141(3):317-327.